LONDON — You know it's Christmas when you're popping down to the local shops for a pint of milk and you see a Reindeer come charging the other way. 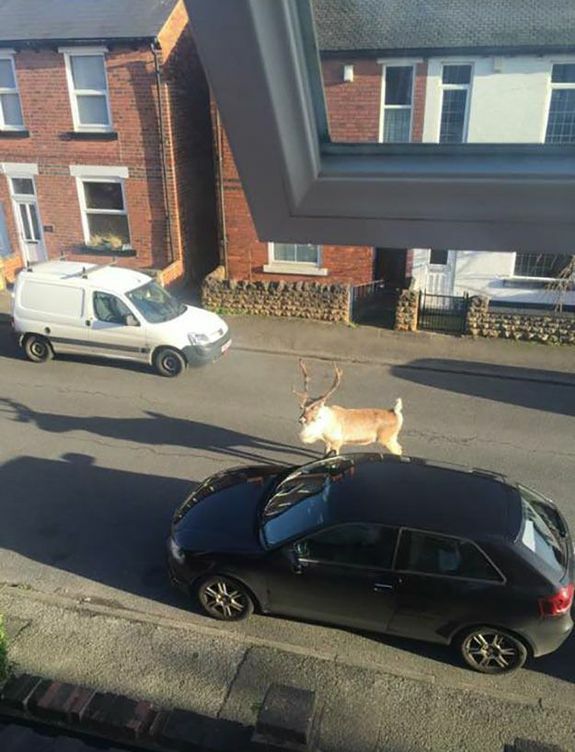 Nottingham was thrown into a whirlwind of festive chaos on Sunday after a reindeer decided to make an escape from a Tesco Christmas event and go on the run. The flighty beast was one of two reindeer being featured in a family event held at Tesco that allowed people to get their photo taken with Santa and his reindeer, according to the Nottingham Post. As they were taking the reindeer into his pen, though, he got free and managed to make a break for it. "It was quite strange. It's like the scene from Arthur Christmas where Santa loses his reindeer. I thought I was seeing things at first. "My partner was out walking the dog and he had to move out the way because it came charging past him." Not your average view from a window in Nottingham. Despite disrupting both traffic and pedestrians, the runaway was eventually found and safely returned to his handlers.